The company had been trying to keep its competitors away from the hue, like Nestle, but a court overruled an October 2012 decision that had said Cadbury (part of Mondelez International) could keep purple as its distinctive color. The UK Court of Appeal ruling now allows not only Nestle, but anyone else, to sell chocolate products with that same colored wrapping. The trademark applied for “lacks the required clarity, precision, self-containment, durability and objectivity to qualify for registration,” the judge said in today’s ruling. 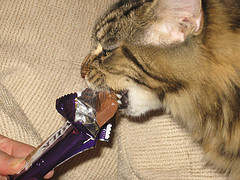 Cadbury is going to consider whether or not to appeal, said the company. “Our color purple has been linked with Cadbury for a century and the British public has grown up understanding its link with our chocolate,” Cadbury said.